Egypt’s foreign ministry has condemned the use of "excessive violence" by Israeli occupation forces against Palestinian protesters gathered at the Gaza border with Israel on Friday to commemorate Land Day. Israeli forces killed 16 of the Palestinian protesters and wounded hundreds, who were among thousands gathered to commemorate Land Day, which marks the 1976 killing of six Arab Israeli citizens by Israel during a protest against Israel’s seizure of Arab land. "Egypt fully supports the legitimate rights of the Palestinian people, at the top of which is the right to establish an independent state with Eastern Jerusalem as its capital as well as their right of return," the foreign ministry said in a statement. The ministry called for the implementation of UN resolutions on the Palestine question and said the international community must observe its responsibilities towards the issue. The ministry added that commemorating Land Day reminds every one of the necessity of working hard and fast to reach a comprehensive and just settlement to the Palestinian issue. Palestinians in the occupied territories are preparing on Saturday for a day of protests and a general strike against the occupation. 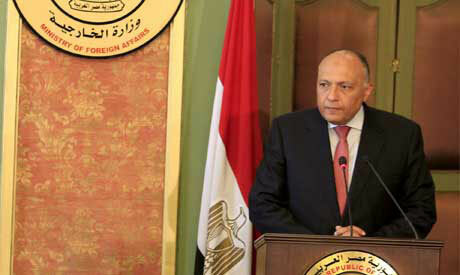 The statement also said that Egypt has called on all parties to maintain calm and self-discipline, as well as avoid exposing the lives of civilians to more danger, and warned of the danger in continuing the status quo without resuming the peace process to reach a resolution based on international law and the two state solution.